Shiny Ampharos in game: 76 Who? Important notice! Pokemon Shiny Ampharos is a fictional character of humans. 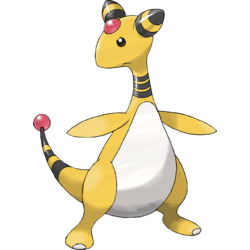 Ampharos (Japanese: デンリュウ Denryu) is an Electric-type Pokémon introduced in Generation II. It evolves from Flaaffy starting at level 30. It is the final form of Mareep. 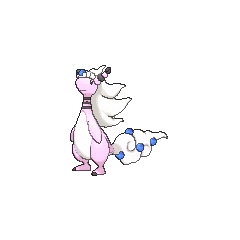 It can Mega Evolve into Mega Ampharos using the Ampharosite. As Mega Ampharos, its toes turn black and it grows white wool at the back of its head and over its tail. Its long wooly tail has many small, red orbs attached to it. Its conical ears retain their stripes, but are now segmented with swirled tips. When it increases the amount of electrical energy within itself, the red orbs on its body and wool emit a strong light. Jasmine has an Ampharos that lights up the Glitter Lighthouse in Olivine City which first appeared in Fight for the Light!. It was sick so Ash and his friends went to Cianwood City to pick up medicine. 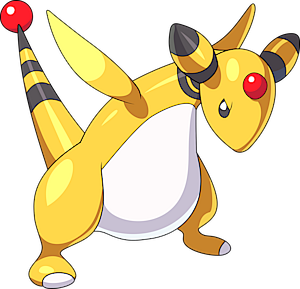 This Ampharos was nicknamed "Sparkle" in the dub. Another Ampharos appeared in Manectric Charge under the ownership of Watt. It was used to battle May's Skitty. Shigeo has an Ampharos which battled against his son Corey's Charizard, Don, as part of Don's training in Those Darn Electabuzz!. 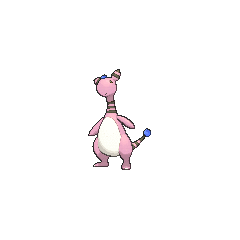 An Ampharos was owned by McCauley in A Chip Off the Old Brock. Karsten owned an Ampharos in Drifloon On the Wind!. Another Ampharos appeared in Frozen on Their Tracks!. It helps in driving a train using its electricity. An Ampharos appeared in The Light of Floccesy Ranch! under the ownership of Ellie. An Ampharos appeared in Clemont's Got a Secret! under the ownership of Meyer. An Ampharos appeared in As Clear as Crystal. An Ampharos appeared in the opening of Lucario and the Mystery of Mew. An Ampharos appeared in One Team, Two Team, Red Team, Blue Team!. Multiple Ampharos appeared in Lost at the League!. An Ampharos also appeared in Genesect and the Legend Awakened at Pokémon Hills. An Ampharos appeared in The Journalist from Another Region!. An Ampharos appeared in SS027. An Ampharos appeared in Kalos, Where Dreams and Adventures Begin! and Lumiose City Pursuit!. An Ampharos appeared in A Jolting Switcheroo!. An Ampharos that can Mega Evolve into Mega Ampharos appeared in Mega Evolution Special I. An Ampharos that can Mega Evolve into Mega Ampharos appeared in a fantasy in Calling from Beyond the Aura!. Multiple Ampharos appeared in Diancie and the Cocoon of Destruction. EP208 Ampharos Ash's Pokédex Ampharos, the Light Pokémon. 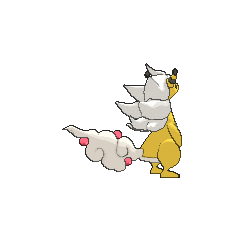 Ampharos emits a strong light from the tip of its tail, which can be seen over long distances and serve as a beacon to those who are lost. AG059 Ampharos May's Pokédex Ampharos, the Light Pokémon. Ampharos has the power to illuminate the tip of its tail. This special ability is used to guide the lost to safety. DP130 Ampharos Ash's Pokédex Ampharos, the Light Pokémon. The tip of its tail shines so brightly that in days gone by people used it to send signals to each other with the light. BW113 Ampharos Ash's Pokédex Ampharos, the Light Pokémon and the final evolved form of Mareep. 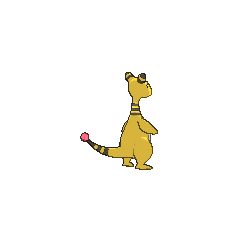 Because Ampharos' light can be seen from a great distance, people once used that light to communicate by sending signals back and forth. 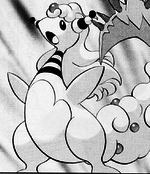 In Pokémon Adventures, Amphy appears under the ownership of Jasmine in Ampharos Amore. Gold and Silver rescued the Gym Leader and her charge in the Tin Tower. An Ampharos helped Emerald in his disabilities when he was younger, shown in The Final Battle IV. Mega Ampharos debuted in a flashback in the X & Y chapter. An Ampharos nicknamed Amphy appears in A Spectacular Battle To Save Ampharos under the ownership of Jasmine. It was not feeling well and Jasmine had Gold go to Cianwood City to get the SecretPotion necessary to heal Amphy. Amphy appears in Light Up The Lighthouse!! under Jasmine's ownership. It became sick and Jasmine had Red get the SecretPotion in order to heal Amphy. Gold, Silver, Crystal, HeartGold, and SoulSilver: Jasmine's Ampharos, Amphy, lights the Olivine City lighthouse. Amphy was initially sick and Jasmine would not allow a Gym battle until it was cured. Pokémon Super Mystery Dungeon: Ampharos is the Leader of the Expedition Society. The other members trust Ampharos, despite his poor sense of direction. The tail's tip shines brightly and can be seen from far away. It acts like a beacon for lost people. The tip of its tail shines so brightly it can be used to send sea-navigation beacons to distinct foreign shores. Moves marked with a superscript game abbreviation can only be bred onto Ampharos in that game. 51%-100% HP If you get lost, you can use me as a beacon! 26%-50% HP This worries me. My health has slid to about half. Level up I leveled up! My taillight burns brighter, too! It attacks by scattering charged orbs of electricity and shooting electric bolts. It restores the Styler Energy a lot. A random lightning strike erases a jagged line of Pokémon. 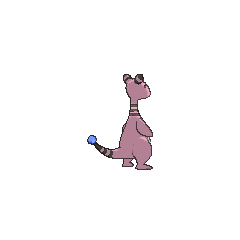 For other sprites and images, please see Ampharos images on the Bulbagarden Archives. Ampharos shares the same category with Lanturn. They are both known as the Light Pokémon. Mega Ampharos has the highest Special Defense base stat of all Electric-type Pokémon. Ampharos is the only Pokémon to have the same Pokédex entry in both Pokémon X and Pokémon Y.
Ampharos resembles a sheared sheep that its evolution line leads up to as they lose wool with each evolution. It also shares traits with a lighthouse, such as its height, stripes and the beacon on the top; the two also share a name. It, as well as its pre-evolutions, may have been based on the title of the science fiction novel Do Androids Dream of Electric Sheep?. Mega Ampharos's Dragon-type, mane, and slender body suggest that it is based on a Chinese dragon. Ampharos is a combination of ampere or amp (a measure of electrical current) and pharos (Greek for lighthouse). The name may also incorporate amph- (Greek for both or on both sides) in reference to the two red orbs on its head and tail. Denryu can be taken to mean 電流 denryū (electric current) or 電竜 den ryū (electric dragon), and it may incorporate 電球 denkyū (light bulb), referring to its tail.